Revolving around the legendary story of the Big Bad Wolf and the lovely little girl, Fairytale Legends: Red Riding Hood is a NetEnt’s 2016 release (followed by Hansel and Gretel slot). Red Riding Hood slot features 5 reels and 20 paylines of incredible action. This incredibly exciting game is built inside the high-quality interface which features brilliant 3D graphics and a rewarding gameplay which houses a couple of highly-engaging features. 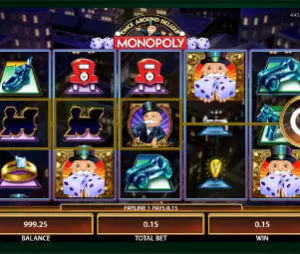 Fairy tale slots (yes, there is a whole line of them), are not for classic Vegas slots fans such as Texas Tea, Big Red or Montezuma – these games are stacked with multiple bonus features, visual effects and what not. Is it up for your taste? That’s for you to choose. NetEnt have preserved their reputation with this great slot game which is filled with plenty of action straight from the off. Rotating background during spins and the little Red Riding Hood moving along as reels spin is just the first enticement in line. The base game is filled with plenty of engaging features. Two Red Riding Hood Wilds guarantee a sticky wild re-spin. Players can also expect a random visit from a fairy which will reward them with three features. First up is a Fairy Magic Spin which transforms the entire reel into one symbol. Secondly, there is a Fairy Surprise which occurs after a losing spin when low-value symbols get transformed into a medium-paying one. Ultimately, there is a Fairy Wild Spin adding Red Riding Hood Wilds to reels to get you a re-spin and boost your chances. Bonus Features are plenty, additionally raising the bar from the rich base game. Three Scattered Treasure Chest symbols are required to unlock the choice of three different rewards. You can select a Coin Win for an instant cash prize hoping to land up to 15x your bet along the way. Free Spins feature will reward you with 10 complimentary spins, while Beware the Wolf Bonus will blow your mind. You will be taken to a board game-type of mini-scenario with 5 types of locations allowing you to grab a coin win, double, grab an arrow, hit the jackpot coin win and collect. Move along the board and grab the goodies, but be careful as the big bad wolf is lurking in the dark. 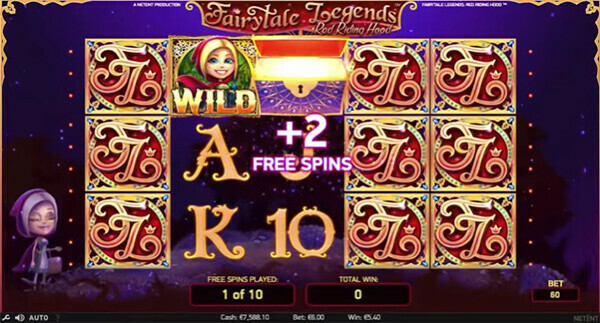 Fairytale Legends: Red Riding Hood slot can freely be described as legendary. NetEnt know their way around creating excellent and feature-rich slot games, which exactly is the case with this particular one. Red Riding Hood is a fitting tribute to a popular fairy tale which offers up to 200x the stake payouts and incredible graphic experience making the game all-around success.